Successfully Added Sunglasses with Secret Bilateral Cameras to your Shopping Cart. Sometimes you have to film things that you can't actually look at and this is where our awesome sunglasses with bilateral cameras are useful. The cameras are built into the arms of the glasses filming your peripheral vision - sideways in other words. You can record either the left side or the right side, and change with one button push on the frame of the glasses. Recording the video is via the included wireless digital video recorder. The color video is recorded with audio so that you can view and listen to your (or the other person's) exploits later. The glasses are attractive but discreet to minimize attention. Another great gadget that's bound to get someone into trouble, buy now at hot Chinavasion wholesale prices and get delivered direct to your door with a 12 month warranty. 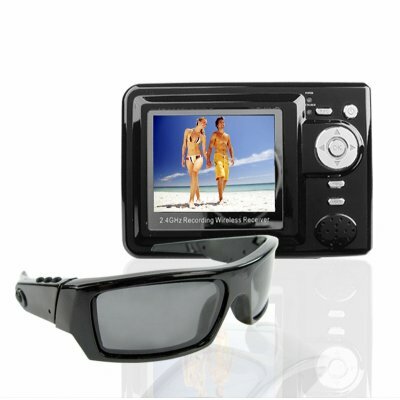 In some countries it is not permissible to import covert ing camera equipment that includes audio recording - please make sure you check your local Customs regulations..
TV system: PAL [Note: PAL is the color system for Europe but since the sunglasses work with the supplied (PAL) receiver it will not cause any problem for US users unless attempting to record onto an NTSC format recorder.